Centre for Science and Environment (CSE) organised a Stakeholder Workshop on Air quality and transportation challenges in Ethiopia and agenda for Clean Air Acton Plan in collaboration with the Ministry of Environment and Forest (MEF), The Federal Democratic Republic of Ethiopia on September 8 in Addis Ababa. Cities of India and Ethiopia face similar challenges. The objective of this workshop was to create a platform of cross learning to deepen policy understanding of the challenges, unique imperatives and local advantages, innovative policy strengths and opportunities for transformative action. This workshop brought together a wide spectrum of stakeholders including policy makers, academia, experts and researchers who are involved with the formulation and implementation of the clean air, transportation and mobility related policies in Ethiopia. Fifty participants representing the MEF; Addis Ababa University; Ethiopian Petroleum Supply Enterprise; Ministry of Transport; Ministry of Urban Development, Housing and Construction; Ministry of Science and Technology; Ethiopian Roads Authority; Ministry of Water, Irrigation and Energy; Addis Ababa City Roads Authority; Ethiopian Public Health Institute; Ethiopian Environment and Forest Research Institute; The Motor and Engineering Company of Ethiopia Limited; Lifan Motors and others participated in the forum. Deliberations were held on key issues pertaining to air quality and transportation in Addis Ababa/Ethiopia, identification of problem areas and strategies and solutions. The workshop began with a welcome address by Girma Gemechu, MEF followed by an introduction to the workshop by Priyanka Chandola, CSE and key note address by Anumita Roychowdhury, CSE. The other speakers include Mehari Wondimagegn, Director, Compliance Monitoring and Control Directorate, Ministry of Environment and Forest, Ethiopia; Worku Tefera. Lecturer, College of Health Science, Addis Ababa University; Manaye Balcha; Ethiopian Petroleum Supply Enterprise; Demisse Alemu, Head, Mechanical and Industrial School, Addis Ababa University Science and Technology Institute and Zerihun Abate, Lecturer, Mechanical and Industrial School, Addis Ababa University Science and Technology. 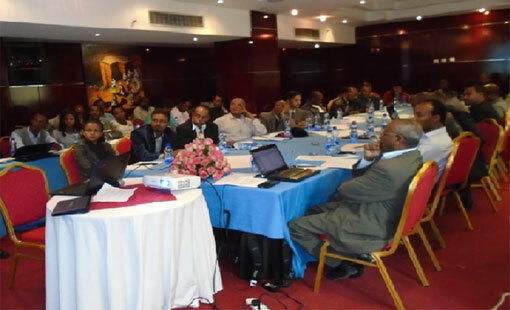 The presentations highlighted the key concerns and challenges in Ethiopia. Tefera mentioned that there is no regular air quality monitoring done and lack of data hampers conduct of studies. There are only few outdoor air pollution and health studies done. He emphasised on need for more air quality and health evidences and establishment of air quality monitoring stations in the country. Manaye Balcha of Ethiopian Petroleum Supply Enterprise informed that the country imports its petroleum fuel requirements. Nearly 2.7 million metric tonnes of fuel have been imported for vehicular use last year. Diesel constitutes 1.7 million metric tonnes of the total. There has been 11 per cent increase in the fuel requirement per year. The country imports two types of diesel sulphur fuel – 500 ppm and 2000 ppm. Nearly 90 per cent of the diesel is imported from the Middle East. The country plans to move to low sulphur fuel. Abate while talking about impact of vehicle emissions on air pollution in Addis Ababa suggested for establishing vehicle emission standards, introducing stringent fuel sulphur requirement and setting age limits on importation of second hand vehicles. Alemu informed that the vehicle population in the country has exceeded 4.5 million growing at an annual rate of 8 per cent. Of these 0.3 million are light duty vehicles which emit about 2.3 million tonnes of CO2 per year. A study was done to set a baseline and develop a national vehicle database for indicating the fuel economy trend. The average fuel consumption for light duty vehicles was found to be 8.4 l/100 km and 7.9 l/100 km in 2005, 2008 and 2010 and CO2 emissions were 217, 221 and 212 gCO2/km respectively. The country aims to increase the vehicle fuel efficiency by identifying and implementing policy measures. CSE flagged off the key concerns for Ethiopian and Indian cities and shared experiences from India/Asia. It was stated that the cities in the region, while having made some significant strides in meeting air quality challenges, face newer challenges. Ethiopia and India needs air quality management approaches including technology leapfrog, scaling up of public transport, integrated multi-modal transport options, car restraints and walking for clean air. CSE suggested that all our cities need Clean Air Action Plan and the principles of co-benefit to guide the roadmap of the Clean Air Action Plan. The strategies would be to set and meet clean air target to protect public health; reduce energy and climate impacts of growth and motorisation; adopt affordable strategies that are equitous and meet the needs of the poor and all other vulnerable sections; ensure safe mobility for all; enhance quality of life; and Integrate the needs of livelihood security. CSE also recommended to develop detailed Clean Air Action Plan for priority areas such as air quality monitoring and management; reduce emissions from vehicles; power plants; air polluting industry; and improve energy access of the poor to reduce biomass based cooking; action on open burning and road dust and construction activities. Three sub groups were created on themes of air quality monitoring and management; technology and regulatory roadmap for clean air and energy efficiency; and strategies of sustainable transportation (walk, public transport, para-transit) to reduce pollution and congestion to discuss and come up with strategies. The participating stakeholders interacted and suggested a variety of measures. The first sub group on air quality monitoring and management suggested developing air quality monitoring and management system; along with establishing ambient air quality monitoring systems; resource needs including human resource, laboratory infrastructure and guidelines; assessing the baseline air pollution status; intervention studies and advocacy, integration of public health awareness, standards, inspection and mitigation etc; adopting WHO guidelines and use of generated data for short-term and long-term health studies. The second sub group on technology and regulatory roadmap for clean air and energy efficiency suggested regulatory measures such as emission tests to be considered; incentives for clean technology vehicles; transition to 50 ppm sulphur fuels and Euro IV emissions technology; importation of environmentally friendly vehicles to be encouraged and extra tax for more cars per family. In order to reduce in-use emissions, the group suggested regular survey of vehicles and strict enforcement; emission tests to be included in the annual tests; incentives to encourage shift of old vehicles to new vehicles and tax reduction on new vehicles; age restriction for vehicle import tec. The third sub group on strategies of sustainable transportation to reduce pollution and congestion suggested to scale up walkways; to encourage and scale up cycle streets as pilot projects (for example the projects in Bahirdar and Addis) and the LRT and BRT projects which will alleviate congestion. The action strategy will focus on air quality monitoring and management, clean vehicle technology and fuels and sustainable transportation. The MEF appreciated CSE’s experience sharing initiative. According to the MEF, this was the first ever discussion held on air quality in Ethiopia. The MEF said that a roadmap will be developed by the CSE.